Leonard, who missed the first 27 games of the season due to a thigh muscle injury, made an impressive cameo in his 15 minutes on court, scoring 13 points with 6 rebounds. Dallas Mavericks forward Harrison Barnes passes the ball around San Antonio Spurs guard Manu Ginobili during the second half of their NBA match at the American Airlines Center in Dallas, Texas, on December 12, 2017. The Mavericks won 95-89. Kawhi Leonard made his long-awaited return from injury but could not stop San Antonio from an upset defeat in Dallas on Tuesday as LeBron James led the Cleveland Cavaliers to a ninth straight win. Leonard, who missed the first 27 games of the season due to a thigh muscle injury, made an impressive cameo in his 15 minutes on court, scoring 13 points and pulling down 6 rebounds. But when Leonard exited as expected early in the third quarter soon after helping the Spurs into a 55-50 lead, the Mavericks came back into the contest to run out 95-89 winners at the American Airlines Center. The defeat was a jolt for San Antonio, which fell to 19-9 for the season. 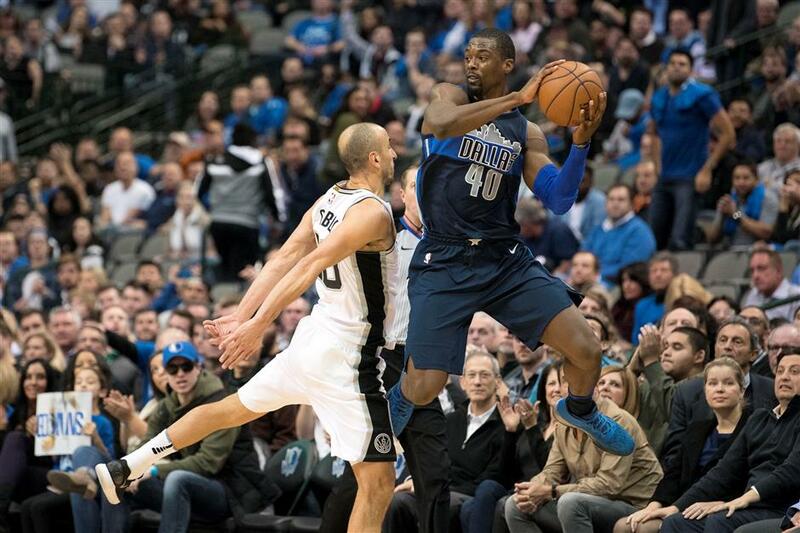 The Mavs improved to 8-20, led by 17 points from Harrison Barnes. In Cleveland, the Cavaliers rained down a bombardment of 3-pointers on the Atlanta Hawks to secure a 123-114 win. Cleveland bagged a season-high 20 3-pointers during the game, with James scoring 25 points and tying a career-high 17 assists. Kyle Korver had 19 points — including 6 3's — while Kevin Love had 17 points and 12 rebounds. Jose Calderon had 14 points. James was satisfied with his tally of assists as much as his points total. "For me to assist my teammates making shots has always been an enjoyment of mine ... my teammates were excellent tonight," James said. "We're in a good rhythm right now. We know what we want to run, we know where guys are going to be out on the floor, we kind of know how defenses have been playing us as of late and guys are moving and sharing the ball extremely well. When the ball is moving, energy is behind it and guys are in rhythm." The Cavaliers improved to 20-8 and have now won 15 of their last 16 games to keep the pressure on Eastern Conference pace-setter Boston. Cavs coach Tyronn Lue said the Hawks had struggled to contain James' passing threat. "I think they do a lot of double-teaming and tilting with the bigs so that allows LeBron to just pick the guys apart," Lue said. Atlanta fell to 6-21, the worst record in the league. Taurean Prince scored 24 points while Kent Bazemore had 20. Elsewhere in the NBA on Tuesday, it was: Knicks 113, Lakers 99 (in overtime); 76ers 118, Timberwolves 112, OT; Nets 103, Wizards 98; Kings 99, Suns 92; and Nuggets 103, Pistons 84.